Rap and Drumming workshops for young people in Monash. 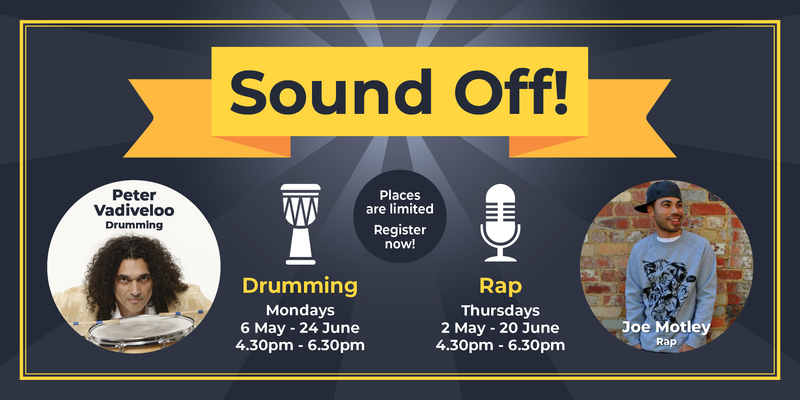 The Sound Off Program is a series of workshops with young people exploring health and wellbeing through music, facilitated by Link Health and Community, supported by Monash Youth and Family Services and funded through the Monash Council Grants Program. The Sound Off project will facilitate participants to explore and experiment with music and storytelling. The project will support and assist participants to develop life skills to cope with challenges and stresses, while building on or creating new strengths in a socially inclusive group environment. Sound Off participants do not require any prior musical experience, ability or knowledge. Places are limited, please register now.